Lock in a great price for Cat House – rated 8.4 by recent guests! Super close to everything, night market, massage, cat house cafe down stairs was amazing!!!!! The staff is doing more than you expect when it comes about helping you. In the rest everything is great. Good location, all facilitiesare very close, markets, exchange offices, food, everything. C'mon ... look at what you're paying. At this price point, hard to see someone doing much better, at least for the three person room we had. Boss lady doesn't speak much English, but she was polite and efficient. Also helped us bargain for a songtheow out at the Main Street when we were leaving. Wonderful lady. Thanks! Staff were very helpful and courteous. The room was clean and shower was good. Very clean, every day, 2bottles of free water daily, nice stuff. 10 m from the location is a very good restaurant with lots of european food. Cheap too. The house is located in a small, nice and calm(!!) street, next to a wonderful restaurant. We stayed here for four days as a couple and it is more than what we expected. The room had more than enough amenities for what you pay for. Other rooms in Chiang Mai would offer the same price for a room with only a fan. This has air-conditioning, hot shower, hair drier, fridge, tv, safe box, balcony, towels, etc. There are only less than 10 rooms so there isn't much noise. It's also walking distance to restaurants, pharmacies, stores, temples, and markets. The place is relatively new and we highly recommend this to couples, small families and backpackers. It also has an awesome restaurant at its corner where we ate at every day! It was so good! Would definitely come here again on our next visit to Chiang Mai. You get what you pay for. It was fine but nothing outstanding. The staff was very friendly and helpful. The staff was really welcoming and even let us check out at 05:00 a.m. in the morning. The room was clean and comfortable and the location was nice too (pretty good restraunt nearby). Cat House This rating is a reflection of how the property compares to the industry standard when it comes to price, facilities and services available. It's based on a self-evaluation by the property. Use this rating to help choose your stay! One of our best sellers in Chiang Mai! 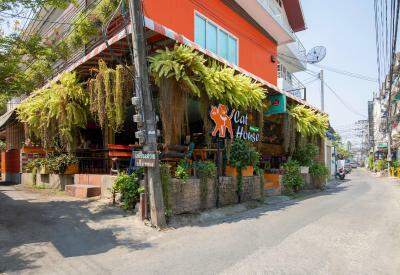 Located in the heart of Chiang Mai, Cat House offers an on-site a la carte restaurant and free WiFi access in all areas. Cat House is 1,950 feet from Wat Chiang Man and Tha Pae Gate. 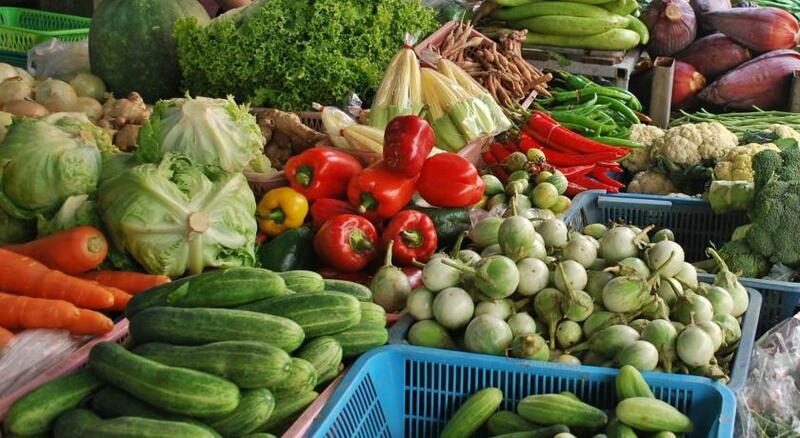 Warorot Market is 2,300 feet from the property, while Chiang Mai International Airport is 2.5 mi away. Each air-conditioned room features a private balcony, a clothes rack and an outdoor seating area. It has a flat-screen cable TV, a fridge and a mini-bar. Hot shower, free toiletries and towels are included in an private bathroom. A dressing table and a closet are offered. At Cat House guests will find camera surveillance system and key card access to the front door. Laundry service and a beauty shop are available at the property. Chang Moi is a great choice for travelers interested in street food, local food and sightseeing. When would you like to stay at Cat House? Located on the 2nd floor, this air-conditioned room comes with a balcony, a clothes rack and an outdoor seating area. It has a flat-screen cable TV, a mini-bar and a fridge.Hot shower, free toiletries and towels are included in an private bathroom. A dressing table and a closet are offered. Located on the 2nd floor, this triple room has a balcony, tile/marble floor and seating area. The bathroom comes with hot shower, towels, and free toiletries. Located on the ground floor, this triple room has a seating area, tile/marble floor and air conditioning. The bathroom comes with hot shower, towels, and free toiletries. Hotel surroundings – This neighborhood is a great choice for travelers interested in street food, local food and sightseeing – Check location Great location - show map Guests loved walking around the neighborhood! House Rules Cat House takes special requests – add in the next step! Cat House accepts these cards and reserves the right to temporarily hold an amount prior to arrival. Please inform Cat House of your expected arrival time in advance. You can use the Special Requests box when booking, or contact the property directly using the contact details in your confirmation. Great restaurant attached with great food and staff. Staff did nit speak english and were not able to help anything. We could leave our luggage there in the morning. Don't drink the beer in the room fridge, not sure if it was out of date but it tasted really off. Very close to everything good about Chiang Mai. Would definitely recommend. Lovely spacious rooms and easy found. The restaurant beside Kham Phai House serves great breakfast and for super cheap. Our room 102 faced the little alley so no privacy and 6am wake up with rolling up the metal doors in the attached business. Location is great. Food right in front was good. Owner was available to assist with anything we needed. Plumbing......toilet constantly filling, noisy while trying to sleep. Good localization, tarrace, the same owner has a restaurant with very good breakfast. Nothing. Everything was just perfect!! Attention: there is a new landlord, who is simply amazing! (Don’t know anything about the old Landlord) We booked about half an hour before we arrived. The new landlord was just amazing and offered us a room although check in time would have been 1 hour later. We asked about a recommendation for renting a scooter and he told us a great place to go (bamboo bikes)! When he wasn’t at the hostel, we were communicating through booking.com PM or through the stuff of his Café (which is right next to the hostel and offers a broad menu all over the world, for reasonable prices! And good coffee and smoothies too! ) We booked only one night, but wanted to extend our stay once we saw our room. Although double bedroom were fully booked, he offered us a triple bedroom for the same price as a double bedroom, because we were only two persons! 17€ for two persons - which is definitely worth the money! It was no problem to store our bags after checking out. The landlord was always helpful and there was never anything which wasn’t possible! This property was extremely friendly all staff, Will was awesome and so helpful we loved it here there was nothing we didn’t like about this property!!! Reception desk was closed during our stay. Had to check in at restaurant who didn’t understand much English. It was difficult to even explain we hadn’t paid for the room rate! We liked the property and room. Restaurant next too it was great too. The lady who runs it is quite often not in reception and relatively hard to get hold of.